Written by David Kirkwood, Editor of Hearing Health @ Hearing Health & Technology Matters on September 24, 2014. Click here to read original article. PISCATAWAY, NJ—An alarming one out of every six American teenagers, or 17%, reports experiencing ringing, roaring, buzzing, or pain in their ears “often or all of the time” after listening to loud music or being exposed to power tools and other sources of loud noise. An additional 29%–for a total of 46%, close to half–report sometimes experiencing such potential signs of hearing loss after such exposure. So reported a nationwide survey of 500 boys and girls aged 13 to 19 that was commissioned by Siemens Hearing Instruments and released yesterday (September 23). The survey, conducted for Siemens byReRez Research of Dallas, collected information from teenagers in all 50 states about their listening habits and possible symptoms of hearing loss. According to Siemens, there is a 95% confidence level that the findings are accurate within 4.4% of the reported numbers. These findings add to previous reports, including in JAMA, that more and more young people are engaging in risky behavior and suffering damage to their ears as a result. One of the most eye-opening numbers in the survey report is the 88% of the young people polled who say they participate in activities that they know may damage their hearing. Listening to loud music without wearing ear protection is the most popular such activity, followed by using equipment such as power tools and mowers and using radio-controlled airplanes and other motorized toys. When asked by the survey how their parents would react if they knew how loud the music was that they listen is, 78% of the teens said their parents would tell them to turn down the volume or to use ear protection. Thus, the survey findings show that the problem of overexposure to music and noise among young people cannot be solved by a simple information campaign. 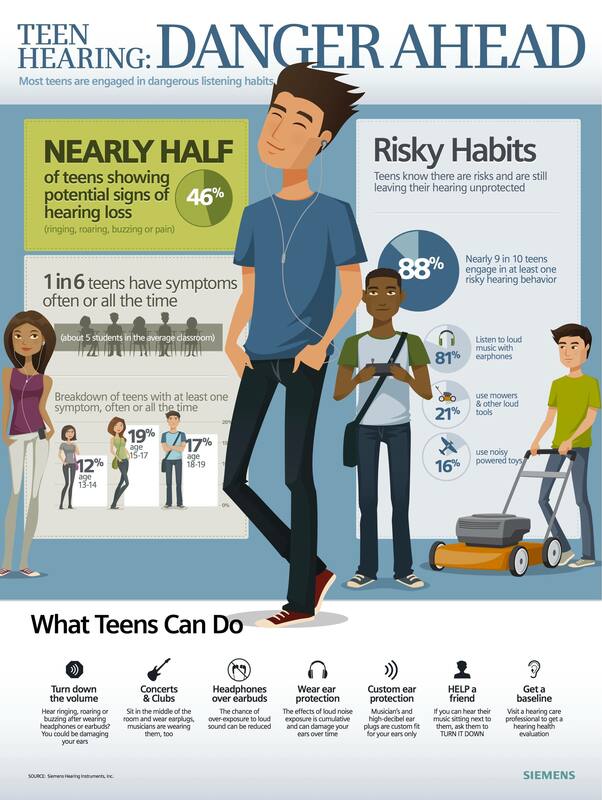 The teens know they are taking chances with their hearing, but do so anyway. That doesn’t mean that nothing can be done to cut down on risky listening. In an interview last week with HearingHealthMatters.org, Donna Grant, AuD, manager of the Active Kids and Teens Program at SHI, and John Urbaniak, a marketing communications and media specialist for Siemens, said that the company has developed a list of recommendations for teens. These recommendations are shown at the bottom of the “Teen Hearing: Danger Ahead” infographic (below), which is part of the social media campaign that Siemens has launched to address the problem.